Andrew Ramsay and Winn Winn. Lexington, Ky. – May 22, 2016 – The Kentucky Spring Classic, the second week of the Kentucky Spring Horse Shows series, concluded on Sunday with Andrew Ramsay taking home the blue ribbon in the finale event, the $50,000 Bluegrass Grand Prix, sponsored by Audi of Lexington, aboard a mount aptly named Winn Winn. Ramsay has consistently finished with top placings on all of his mounts throughout the Kentucky Spring Horse Shows series and placed second in the Kentucky Spring Horse Show’s $50,000 Commonwealth Grand Prix, behind Kristen Vanderveen and Bull Run’s Eternal, with Cocq A Doodle. “George gives me a lot of tips,” said Ramsay. “I get very good advice from him. He’s an amazing coach to have, and it’s a great opportunity to have his help here. Following closely behind Ramsay, just 4/10ths of a second slower, was Ramiro Quintana and Whitney, owned by St. Bride’s Farm, who tripped the timers in 38.459 seconds. The pair went on to claim second place honors, while Andrew Bourns and his own Hyakari rounded out the top three of the class in 40.498 seconds. Ramsay was thrilled to not only wrap up a stellar two weeks of showing at the Kentucky Spring Horse Shows series, but also his first time ever competing at the Kentucky Horse Park with a win. “It’s my first time showing here at the Kentucky Horse Park,” said Ramsay. “I came in 2010, when WEG was here, and that was my first time here to see a competition. When we made the summer schedule and decided to stay in the U.S. for the summer, it was either Old Salem or Kentucky and I wanted to come back here and we’ve had a great time. Earlier in the day, the Under 25 Grand Prix was held in the Rolex Stadium and the first place prize went to Tina Yates and High Point Farm’s Biallon. Yates had three different mounts entered in the class and qualified both Biallon and Zelote VDL for the jump-off before any other horse and rider combinations, out of the 20 starters, had also advanced to the jump-off. “The first round I went second on Zelote and really my strategy was to go and have a nice round and just ride exactly what I walked,” said Yates. “On my second one, I had the exact same plan. I knew the time allowed was a bit tight so I had to keep going around the turns, but I think it definitely presented some challenges. It just required a little bit of smart riding and riding a smooth track. Yates was almost going to be only competing against herself in the second round until Venezuela’s Emanuel Andrade and his own Natif Des Roches added themselves to the good list with a faultless effort. The courses in Sunday’s competition, once again designed by Olaf Petersen, proved to be technical and tricky with only two riders moving on to the jump-off. Yates returned to the ring first in the second round aboard Zelote VDL, but had an unfortunate fall after a refusal. However, even after her unexpected dismount, Yates was up next in the jump-off again with Biallon. Yates proved her resilience and completed the jump-off course with Biallon, finishing on a 4-fault effort of 44.913 seconds. Andrade was the only contender to challenge Yates’ top spot, but pulled two rails resulting in an 8-fault finish in 39.334 seconds, garnering them second place. 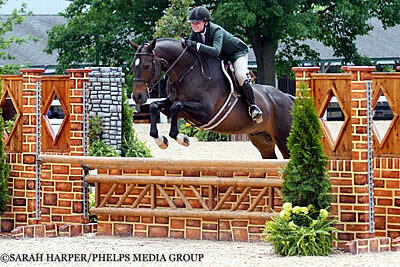 “When I came back on Biallon after my fall with Zelote, I wasn’t so much nervous as I was a bit upset,” said Yates. “I had a really good start, and I just had a little bit of a bad angle to the jump. I just needed to sit behind him and squeeze, and unfortunately it happens sometimes, but you just have to brush it off your shoulder and shake yourself off and go get on the next one. The U25 Grand Prix series continues to be a popular class among young riders who have aspirations to be more competitive in the higher-level international competitions in the future. It’s chance for young riders to showcase their talent in the show jumping sport and give them their first experience to learn how to compete at the 1.45m level under FEI regulations. Similar to Ramsay, the Kentucky Spring Horse Show series is also Yates’ first time competing at the world-class Kentucky Horse Park facility. The Kentucky Spring Classic concluded with picture perfect weather for Children’s Hunter riders in the Stonelea Ring on Sunday. Alexandra Smith and Eclypse took home the championship in the Children’s 14 and Under Hunter division as well as the overall grand champion children’s hunter prize sponsored by Visse Wedell at Douglas Elliman Real Estate. Smith was thrilled with her rounds on Sunday aboard Eclypse, an 8-year-old Hanoverian mare. “She was absolutely perfect,” Smith said. The addition of a brush fence used in Saturday’s $5,000 Hallway Feeds USHJA National Hunter Derby did not faze the pair at all. “She didn’t look at the brush fence at all, she made it easy,” Smith explained. The pair swept the over fences classes, also winning an over fences class on Saturday, on their way to the grand champion award. Although Smith and Eclypse are a relatively new partnership, they already show a great deal of promise. Twelve-year-old Catherine Chartier and Notorious, an 18-year-old Warmblood gelding, captured the win in the NAL/WIHS Children’s Hunter Classic with an inauspicious beginning in the earlier first round of the Children’s 14 and Under Hunter over fences class. Chartier fell off after a refusal, but persevered to come back and score an 80 in the first round and an 81 in the second round for a final score of 161. Second place went to Vyla Carter and Skyfall with a score of 160. “I fell off in my first round so I really didn’t expect to win after having such a rough weekend,” Chartier said. With the conclusion of the Kentucky Spring Classic and the Kentucky Spring Horse Shows series, Kentucky Horse Shows LLC will now be gearing up for the Kentucky Summer Horse Shows series with the Kentucky Summer Horse Show running July 27-31 and the Kentucky Summer Classic running August 2-7.